You like what you’ve read? Try these steps . . . Complete all the activities in the workbook yourself. God is most interested in how we live Monday to Saturday. Sunday, all of church life, helps us to do it better. Advise them that you are about to test it with a small group of five. Promise to share your experience with that small group as it develops. Select five members who like the idea (as in the italics above) to meet five times to try out a new direction in mission – each member living his or her daily missions in deed and word. — Begin with the “Activity 1,” p. 38 of the workbook. — one per week, pp. 39-42. –What is God already doing here? –How will I join what God is doing? –Whom will I ask to be my teammate? Share your experiences to date with the official board. If they are willing, they share one worksheet per meeting; two members share their responses for review and learning by all. Allow 10 minutes for this item on the agenda. Teach and preach living each of your daily missions; for ideas, see Chapter 16 of When the Members are the Missionaries and the home page for Basic Tools, Resources, Videos, and Member Mission Stories. Pray for the members’ daily missions each Sunday – one mission field per week, then repeat. 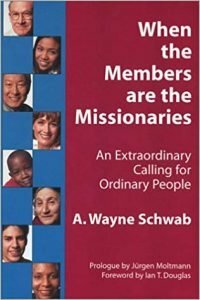 For more, see Chapter 16 of When the Members are the Missionaries. a. Gather on Sunday morning to reflect on one of the day’s readings using the procedure outlined in Chapter 15 of When the Members are the Missionaries. After two or three Sundays, the group will follow this pattern easily. c. Help selected members to describe one of their daily missions on a Sunday morning. If a person is reluctant to be “up front,” offer to tell the story for him or her. Orient all seeking membership, baptism, or reaffirmation of faith to church life as sharing in God’s mission in Jesus Christ with the help of the Holy Spirit. Use as many of the workbook’s sections as appropriate for the situation. Other methods are found in Basic Tools and Other Resources on the web site, www.membermission.org. Work with each church group to find ways it can include supporting the members in their daily living as one of the group’s purposes.